The Broadway smash “The Book of Mormon” fills the Bushnell with uplifting songs and slapstick comedy. At the same time, the script explores the dark topics of intense poverty, religious proselytism, and societal acceptance. “Mormon” was written by South Park creators, Trey Parker and Matt Stone, and Robert Lopez of Avenue Q fame. Any audience goer who is familiar with either of these shows will not be surprised to hear that there’s quite a lot of vulgarity in this musical. Though crudeness is used as a comedic device and is not central to the story, if you’re offended by foul or non-politically correct language, this may not be the play for you. The writer’s voices clearly come through, thematically, musically, and occasionally even through a distinct tone, which diehard fans will pick up on immediately. The songs are gorgeous and fun, as well as hilarious. Though the show is stylistically rooted in traditional musical theater, the writers occasionally break away into other genres. In “Joseph Smith American Moses” the song moves through popular styles of 1970’s West African music -- Afrobeat, Juju, and Highlife -- while staying true to the theatrical nature of the scene. On a different note, the song “Baptize Me” takes us to a tone reminiscent of 1980’s movie love scenes. After opening on Broadway almost six years ago, the show is currently on its second U.S. tour. The ensemble cast sells the show, with the secondary actors playing multi-roles. 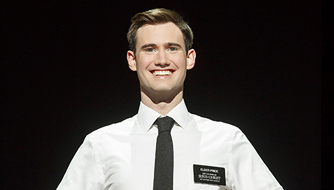 The leads are perfectly cast; those who especially stand out are Gabe Gibbs as Elder Price, Conner Pierson as Elder Cunningham, Leanne Robinson as Nabulungi, and PJ Adzima as Elder Mckinley. Each talent is equally strong between dialogue, song, and the big dance numbers. Fans of South Park and/or Avenue Q will find similar style and humor in the signature comedy and social commentary which is alive and well in “The Book of Mormon.” Though the play certainly has moments which devout Mormons could find blasphemous, it is not an attack on religion. For those open-minded and not offended by some vulgar language, they’ll find a story about people born into very different worlds, struggling to find joy and faith in difficult circumstances. The message is surprisingly positive and uplifting. Lovers of musical theater, who don’t happen to also enjoy South Park, can still love this production.